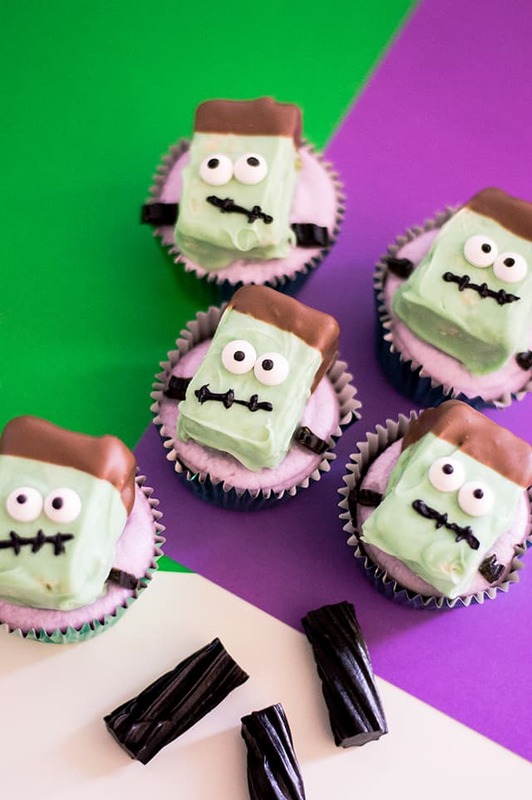 These Frankenstein Cupcakes are the perfect Halloween dessert. They’re great to make with kids or for kids. 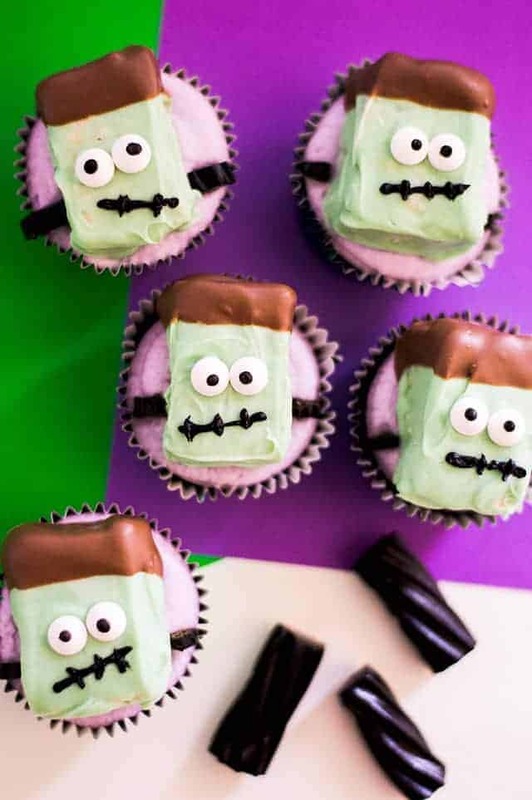 Frankenstein is a rice krispies treat dipped in candy melts and topped on a purple vanilla frosting. My son is all about Halloween this year. He’s been drawing up huge pumpkin head skeletons to hang up and everything. Don’t ask where he came up with pumpkin head skeletons, I don’t have a clue. Needless to say, he was excited for these Frankenstein Cupcakes. Hey, I even got him to watch The Nightmare before Christmas with me. Tim Burton is my kind of weird and creepy. 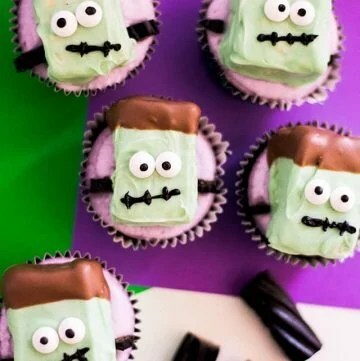 To get this frankenstein cupcakes recipe started, bake up your favorite chocolate cupcake recipe. I just quickly baked up my favorite chocolate cake mix according to the box. It really all depends on how much time you have and what you feel like doing. I prefer the chocolate fudge cake mix if you’re wondering. Don’t tell anyone, but I find that people really only care about the homemade frosting when it comes to cupcakes. I’m not sure why that’s a thing, but it is. 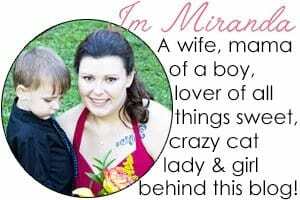 No complaints here though, it makes whipping up cupcakes for a school party pretty simple. While the cupcakes are cooling completely, work on the purple frosting. Whip up the butter, powdered sugar, milk, and vanilla extract. Next, grab some purple gel paste color. My favorite brand is Americolor, but I didn’t have any purple on hand. Add enough for a medium purple color or if you prefer a darker purple, add a little more. Add the frosting into a piping bag fitted with a straight tip or coupler. Add a nice mound of frosting to the top. To make a mound, I hold my piping tip into the center of the cupcake and apply even pressure to the frosting while very, very slowing pulling up. 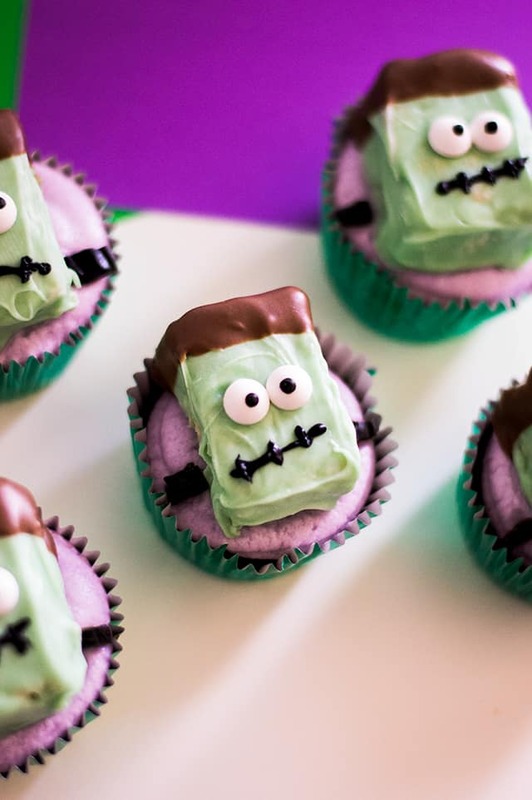 It may take a couple of tries to get the perfect mound of frosting, but your Frankenstein cupcake topper will cover it anyway so no worries. For my Frankenstein Cupcake Toppers, I thought it was best to use store bought rice krispies treats because they’re firm and easy to cut. Homemade rice krispies treats are 100% better if you’re just enjoying it as a treat without having to dip it in candy melts. Though, I do have these chocolate dipped rice krispies treats that are pretty great. First, cut the treats in half. Then melt the green and white candy melts with coconut oil together in 30-second increments. I love using the refined coconut oil since it’s flavorless. 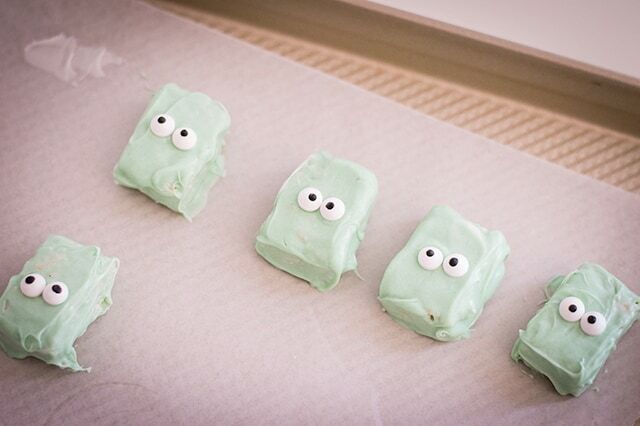 Dip the treats in the light green candy melts and place on the wax paper to dry. Quickly pop the eyes on the Frankenstein. Melt the chocolate candy melts in 30-second increments once the green candy melts have dried onto the rice krispies treats. Dip the top of Frankenstein into the candy melts to make his hair. You can also use black candy melts. Make some finishing touches with black icing. Give him eyebrows, a mouth, and maybe some stitches. Add pieces of black licorice on either side of Frankenstein once he’s placed on the frosting for his bolts. Preheat oven to 350 degrees. Line a cupcake pan with green cupcake liners. In a large mixing bowl, add in the chocolate cake mix, water, vegetable oil, and eggs. Beat with a hand mixer on medium until incorporated. Let the cupcakes cool completely. Work on making the Frankenstein cupcake toppers and frosting while waiting. In a large mixing bowl, add in the butter, milk, vanilla, and powdered sugar. Beat on medium until the powdered sugar is incorporated. Add in the violet gel food coloring and beat for 1 minute until the frosting is light and fluffy. Add the frosting into a piping bag fitted with a straight tip or coupler. Set aside. Line a cookie sheet with wax paper. Cut rice krispies treats in half. In a microwave-safe bowl, add the green and white candy melts and 1 tsp of the coconut oil. Microwave in 30-second intervals until the candy melts are completely melted and smooth. Completely immerse each rice krispies treat into the melted candy and place gently on lined cookie sheet. Working quickly, place 2 eyes for each coated rice krispies treat. Allow to set. 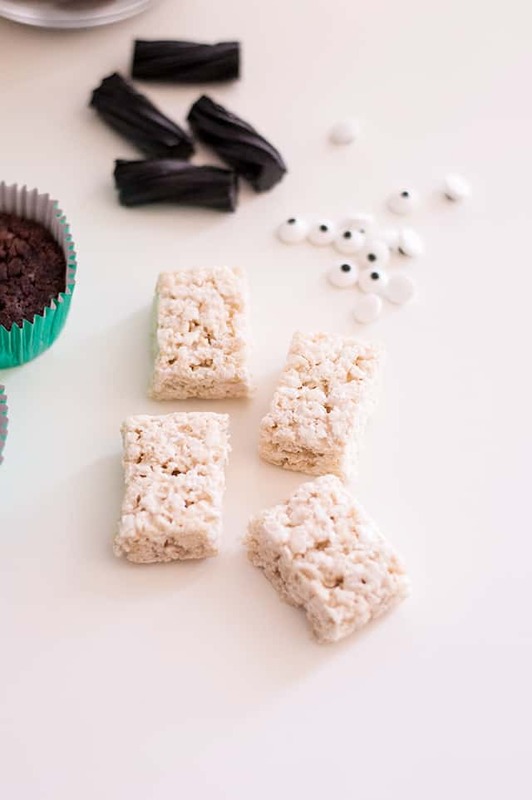 Melt chocolate candy melts and remaining coconut oil in the microwave in 30-second intervals and dip the top part of your rice krispies treat in it. This will become Frankenstein’s hair. Place back on lined sheet and allow to set. Use black icing (I just used store-bought) to draw eyebrows and mouth. Pipe a large mound of frosting on each cooled cupcake. Place the Frankenstein topper in the center of the cupcake pressing down gently. Add the black licorice on either side of Frankenstein for his bolts. Serve! Store in an airtight container.